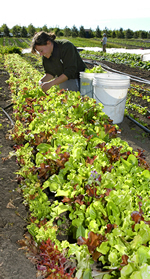 The College of Agricultural, Human, and Natural Sciences (CAHNRS) is offering an undergraduate* Certificate in Organic Agriculture. The certificate can be obtained on the Pullman campus or entirely online through WSU Distance Degree Programs. Working professionals, other non-degree-seeking students, as well as current students in other majors at WSU will be able to learn the fundamentals in a highly focused program through online and classroom venues. *Please note that this certificate was designed for undergraduate students. Although graduate students may obtain the certificate, required courses may not all be available at the graduate level.